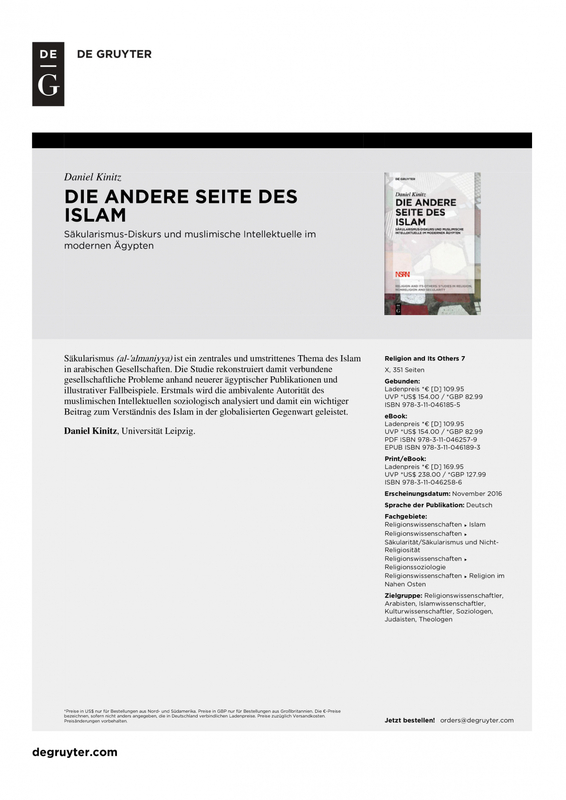 Book Release: Daniel Kinitz on "The Other Side of Islam"
We are happy to announce the release of the book "Die andere Seite des Islam. Säkularismus-Diskurs und muslimische Intellektuelle im modernen Ägypten" (The Other Side of Islam. The Discourse on Secularism (al-ʿalmānīya) and the Muslim Intellectual in Modern Egypt) by our Senior Researcher Daniel Kinitz. The book is published by De Gruyter as volume 7 of the series Religion and Its Others. Studies in Religion, Nonreligion, and Secularity, it is written in German. Al-ʿalmānīya (secularism, secularity) is an important yet highly divisive issue in the Arabic world. This study reconstructs, on the basis of recent Egyptian publications and illustrative case studies, the social and religious challenges attached to al-ʿalmānīya as Arabic concept. Stressing the ambivalent authority of the Muslim intellectual from a sociological point of view, Kinitz’s study is an important contribution to understanding Islam in the globalized present.